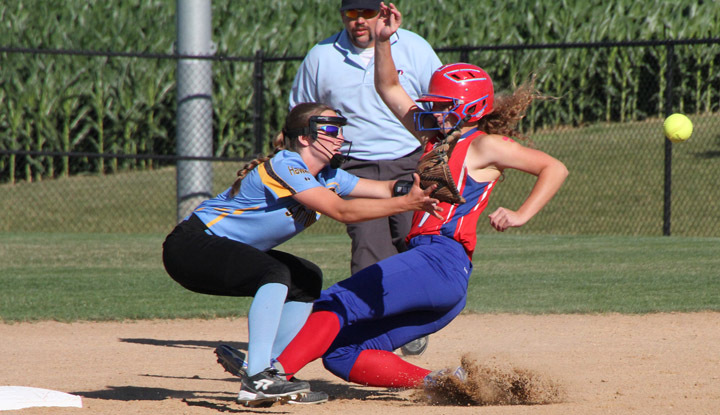 Six games in six days – the Lynnville-Sully softball team is getting plenty of experience in during the final days of the regular season. The girls went 4-2 in recent games, which included three important conference wins. Tenth-grader Shiloh Cunning-ham is at bat for the Hawks at Pack the Stands night. 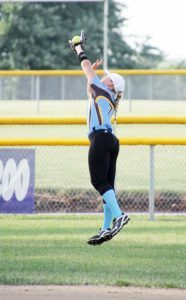 Left fielder McKinley Conover attempts to catch a fly ball in the game against Montezuma. The Hawks won, 5-2. Seeking revenge after a 1-0 loss to the Bravettes earlier this season, the Hawks zipped over to Montezuma, winning 5-2, on Wednesday, June 21. The L-S girls got on top in the first inning with one run, but the Braves quickly answered with two in the bottom of the third. L-S brought home another run in the fourth, tying the game. Both teams were scoreless in the fifth. The Hawks rounded up three runs in the sixth and held off the Braves from scoring anymore. L-S had a solid 13 hits out of 31 at bats throughout the night, averaging .419. Sophomore Carson Fisk went three-for-four with an RBI and a stolen base. Sophomore Shiloh Cunningham was two-for-four and smacked a home run in the fourth inning. Freshman Mallory Loftus pitched all seven innings. She allowed for eight hits, with the Hawks only allowing two to cross home plate. Loftus threw three strikeouts and walked none. On the JV side, the Hawks came up a run short, 7-6. The girls put up five runs in a last-ditch fifth-inning effort but it wasn’t quite enough to overtake the Bravettes. The following day, the Hawks traveled to Grinnell, suffering a loss to the Tigers. L-S battled but couldn't walk away with the win, losing 6-1. The Hawks struggled offensively, their only run coming in the fifth. The Tigers clawed at them throughout the night, scoring in the first, fourth, and sixth innings. L-S had four hits and one stolen base. Three different players took turns on the mound. Freshman Mallory Loftus pitched three innings, eighth-grader Caitlin Alberts pitching 2-1/3, and Fisk pitching two-thirds of an inning. Combined, they walked five and threw three strikeouts. They allowed for nine hits and six runs. The JV girls suffered another one-run loss, coming up short of Grinnell, 4-3. Runs were scored by Caitlin Alberts, sophomore Kaylee Maasdam, and freshman Kaleah Ehresman. L-S hosted the North Mahaska Warhawks on Friday for the night of Pack the Stands. The Hawks put on a good game for the home crowd, taking the win 2-0. All the scoring came early in the game in the first two innings. “This was a well-played game on both sides,” commented L-S Coach Stacey Alberts. The Hawks had one run in both the first and second innings. Both teams were scoreless the rest of the game. “Offensively, we had the timely hits to push a few runs across the plate,” noted Alberts. The Hawks had six hits throughout the game. Senior Brenna Lanser was one-for-two, walk-ing once. She accounted for one of the two runs, getting brought home by junior McKinley Conover. Lanser stole two of the four Hawk stolen bases. 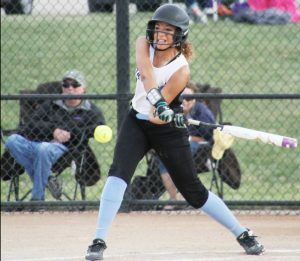 Eighth-grader Korinne Jansen was two-for-two, also getting walked once. Freshman Janelle Rozendaal hit Jansen home for one of the Hawks’ runs. Jansen had the other two stolen bases for the night. Loftus pitched another strong game, throwing all seven innings and shutting out the Warhawks. Loftus walked none and threw five strikeouts. She allowed six hits, but with the help of the defense behind her, did not give up any runs. In the JV game, L-S ended up tied with North Mahaska, 10-10. Freshman Abby Gruver made it home three times for the Hawks. The Hawks split games over the weekend, winning against Des Moines Roosevelt and taking a loss against Lisbon at a tournament in Marshalltown. The score was close throughout the whole game, but L-S got the win in the seventh inning, 9-7, against Des Moines Roosevelt. It was a back-and-forth match-up with the score tied 2-2 after the second and then tied 6-6 going into the seventh. The Hawks squeezed in three runs and allowed Roosevelt just one in the final inning. The L-S girls had 13 hits in their 32 at bats. Freshman Mallory Loftus went three-for-four and brought in two RBIs. Senior Brenna Lanser was two-for-three, scoring twice, and had two RBIs and a double. Lanser’s double was one of three during Saturday’s game. Loftus pitched all seven innings. She allowed for 10 runs, striking out two and walking two. The Hawks went on to play Lisbon, unable to secure the win, losing 2-0. Lisbon scored two in the fifth, the only runs for either team. L-S struggled to push hits across the plate. They ended the game with one hit, a double from Fisk. Alberts pitched 4-2/3 innings and Loftus threw the remaining 2-1/3. They combined for six hits and five bases on balls. The Hawks came out with the win after a hard-fought battle against BGM on Monday, June 26. The Hawks ended the game up 7-4. L-S got off to a slow start with the Bears taking the early 1-0 lead going into the third. The Hawks changed that around, scoring one in the third inning, three in the fourth, one in the fifth, and two in the sixth. The Bears tried to come back but couldn’t do it, scoring one in the fifth and two in the sixth. The Hawks squeezed seven runs out of six hits, stealing eight bases throughout the night. Fisk accounted for two of these stolen bases. Senior Haley James was one-of-three with a double and a stolen base. Lanser went one-of-two, pounding out a double, bringing in an RBI, and stealing two bases. Freshman Mallory Loftus was credited with the win, pitching six innings. She allowed for eight hits, walking two and striking one out. Alberts finished up the game for her, with no errors. In the JV game, L-S finished with another tie, 9-9. The Hawks’ bats really got going in the second inning with six runs scored. Ehresman, Gruver, and Alberts each scored twice for L-S. The regular season will come to a close this week for the 16-9 L-S varsity girls. They were scheduled to play at HLV on Wednesday and at a tournament in Carlisle this Saturday. The regional tournament will begin on Monday, July 3. Thanks to a first-round bye, though, L-S won’t play until Wednesday, July 5, when they will host the winner of the July 3 Colo-Nesco versus GMG game. Game time is 7 p.m. in Sully with the winner playing in Sully on Friday, July 7.